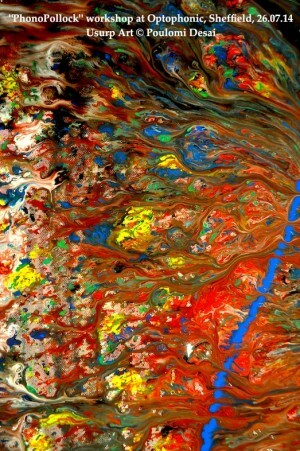 What might have Jackson Pollock’s canvas sounded like while he thrust, dripped and splattered paint on it? Using a variety of paints and a large stretched sonic canvas, the Conspirators of Pleasure (Poulomi Desai and Simon Underwood) will lead a workshop to find out. Visitors will become performers, the textural sounds created will be processed and performed live, and projected. A series of call and response improvisations ensued with the final results of the canvases being analysed for projective meanings. This is a new project conceived by Poulomi Desai and commissioned by Peak to Signal Noise. The OptoPhonic Workshop was a day of participatory workshops and exploratory performances combining film and sonic experiment and hands-on creative contagion for all. Also featuring workshops and performances by Adam Bohman, Sharon Gal, Heather Leigh, Rhodri-Davies, Murray-Royston-Ward, Blood-Stereo, Human-Heads, Mick-Beck, Luke-Poot, Blue Yodel and McWatt/Bettany.